Square stopping a room, like this photo shows, is a contemporary look and while harder for the plasterer, it looks great (it doesn’t have a scotia) and is effective when the same colour (and ideally finish) is used on the ceiling and the walls. The surface can be sprayed and back rolled. For commercial applicators, Resene SpaceCote Flat Commercial Spray Grade in 10L is the ideal product for these surfaces. 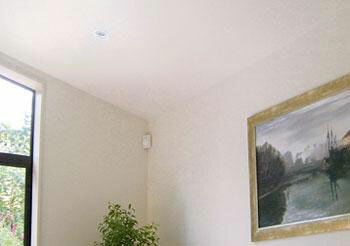 Resene SpaceCote Flat Commercial Spray Grade is specifically developed for spray application. It is not designed as a high build so cannot be layered . If the application dictates then you can back roll as you progress. The wallboard manufacturers also like to see the additional texture that is achieved when back rolled. Back rolling means that after spraying an area another painter rolls over it with a dry roller – it is significantly quicker than rolling a wall without spraying. Extend the sealer and Resene SpaceCote Flat Commercial Spray Grade onto skirting boards, door and window frames. Resene Lustacryl semi-gloss waterborne enamel or Resene Enamacryl gloss waterborne enamel (1 or 2 coats depending on colour) can then be brushed on to them after sanding and filling any gaps and/or nail holes. You need to ensure good drying conditions for the paint – ensure there is sufficient warmth and air movement to dry the paint and disperse the moisture coming off the drying paint film. See the Resene SpaceCote Flat Commercial Spray Grade data sheet for more technical information.